I would never have bought this toy, I received it as a gift last Christmas and surprisingly, it’s a really fun kids toy. 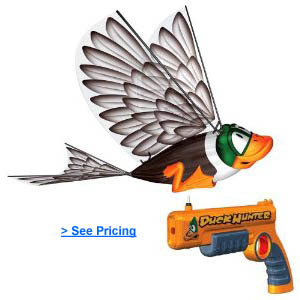 The box reads, “charge, toss and take aim at the Indoor/Outdoor Duck Hunting game”. I was only brave enough to try this outside, but if you have really high ceilings in a very large room with nothing break-able, then why not give it a try inside? (This is going to remain an outdoor only toy at our house). The duck does have 2 distance settings so that you can have it go on short flights in circles for indoor use and longer distance flights for outdoor use. This toy is rated for kids 10 years old and up, but it can be fun for younger kids too. The duck does need to be charged and launched carefully, so you will need an older child or grown up do the setup and launch the duck, but that doesn’t mean that kids as young as 4 years old could enjoy the “shooting” aspect of the game. When I play with my 4 year old boy, I always charge the duck and then launch it into the air for him and then let him shoot at the duck. He does really well with it and thinks it’s really fun. The duck has to be hit 3 times before he comes down. Each time he’s hit, the duck stops flapping his wings momentarily and dips in flight a bit to show that he’s been hit. After that third hit, the duck glides down to the ground. Then it’s time to charge him up (about 10 seconds) and he’s ready to fly again. If you are looking for a unique outdoor toy, then you may want to “give this one a shot”.